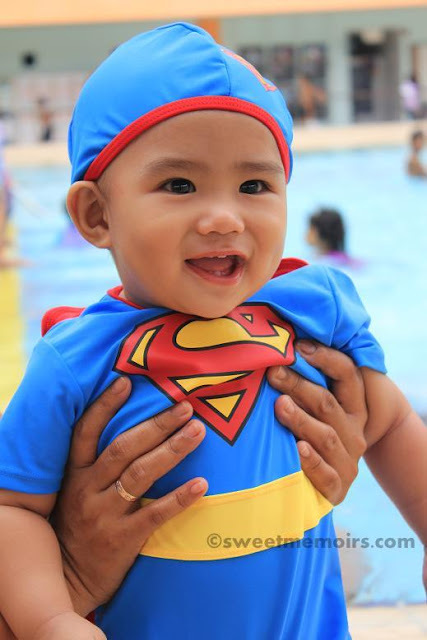 Can't get enough of my Gian's cuteness on his Superman swimwear (smallest size) we bought at Baby Expo. He wore it on his first swimming session. Superlove this superbaby! Everyday we are grateful for having him and big sister Kyla in our lives. We are so blessed for having such healthy and happy babies. A delightful young superman indeed! I know just how you feel and the happiness your lovely children bring into your life! I feel the same way about my two boys and two girls -- although they're certainly not "boys and girls" any longer, but they're still a source of endless joy -- even in their 40s! Wishing all of you a lovely weekend! super cute, super love his superman swimming attire Che, have a happy weekend you all. give my hugs to Gian and Kyla, they are so adorable, you all are blessed to have each other. There must be a super mother behind. He sure is very cute! Have a great weekend! super duper cutie!!!! ahhhh you are blessed twinzy..would love to someday kiss and hug you little superman mmmmwahhhhugggg!!!! Swimming is always fun and with such swimwear even more. Great picture. Gian is super cute! Thanks for sharing your blues. Blue Eggs, have a great week ahead! Cute! And a great portrait! nice, big smile ! cute superman !! !